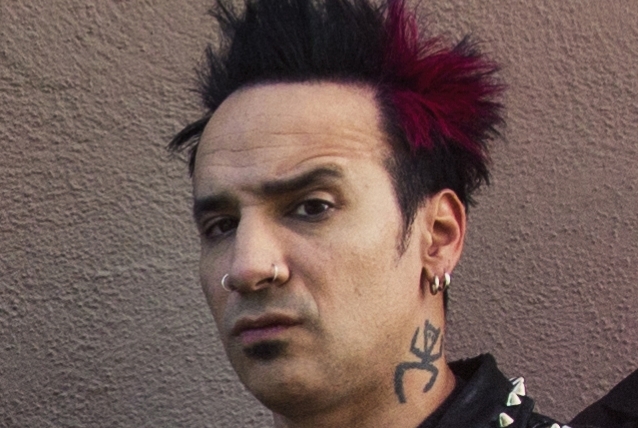 STONE SOUR drummer Roy Mayorga has confirmed to the "Talking Metal" podcast that he is planning to record a solo album once the band goes on hiatus in 2019. "I don't know if a lot of people out there know what I do other than play drums, but I also compose a lot of music for indie films and commercials and stuff like that, on the down time," he said. "I use a lot of hardware modular synthesizers. So the material on the record that I'm gonna be working on is gonna be mostly just drums and modular synthesizers. No format of verse-chorus-verse-chorus; it's gonna be pretty experimental and improvisational. I'm hoping to do a nice 16 minutes a side of a record — kind of the old-school style. The way you would hear a TANGERINE DREAM record or a Jean-Michel Jarre record — those old electronic records from the '70s. But it's not gonna sound like that; it's gonna be more in that format." Speaking in more detail about the modular synthesizer, which is a type of synthesizer that exists in both physical and virtual forms, consisting of separate specialized modules, Mayorga said: "There are amazing possibilities with this instrument; you can do a lot with it. You can sequence it; you can just come up with some insane sounds and soundscapes wih it. "I really love the sound of synthesizers; it's made a huge impact on me when I first discovered them hearing the soundtrack to, say, 'The Shining'," he continued. "Wendy Carlos did the opening theme to that; I'm sure everyone's aware of that song. And after that, that pretty much opened the floodgate to all electronic music to me. I soon discovered KRAFTWERK, then Jean-Michel Jarre, TANGERINE DREAM… I mean, the list goes on. There were so many artists at that time that were using synthesizers, and I just love that sound. And learning to play drums at that time, I kind of learned both growing up and wanted to marry those two forever as just those two. Now that I have the chance to do that, I'm definitely gonna do that now once I have the break." According to Mayorga, the "raw plan" is for him to get his solo album out by the end of 2019, with "some performances" scheduled "before the release at various clubs around L.A. or whatever… San Francisco or Chicago." The next STONE SOUR LP will follow up 2017's "Hydrograd", which was reissued last month in a deluxe expanded edition and contains the chart-topping single "Song #3". Taylor did confirm, however, that he will step away from STONE SOUR in 2019 to focus on the next album from his other band, SLIPKNOT. He remarked that the enforced break for STONE SOUR will "allow the audience to miss [STONE SOUR], which is the best thing in the world you can have — that built-in need for a band to come back."